Greece is one of the countries with splendid historical heritage and it is impossible to imagine the world without it – a Greek island Tinos in the Aegean Sea is no exception here considering its rich culture and history. Its terrain is characterised by terraces with small villages that are interlinked by means of stony paths and walls. A really interesting house, designed by mXarchitecture office, was built on this island in 2009. The house, reminiscent of a miniaturised stony village, is respectfully located on the ruins of an old, traditional building on the edge of the village. It is complex and organic. Due to its unique combination of the contemporary and the traditional, the house was nominated for Hiše Awards in 2011. In order to understand the house designed and completed by mXarchitecture architects in one of the Greek islands, we must first analyse its floorplan. This delineates the form of a miniaturised village inside a wall, with a tower in one of its corners, and water in the centre of the habitat. The aim of this project, established on the grounds of quite extensive research work, was to set up a house within an existing framework. Its carefully prepared design has been based on the idea of alternating constructed and empty spaces. The solid volumes, which are designed as archetypal elements, form a reduced-size square within their ground plan. The architects were inspired by typical local elements found in the area during the construction. The house consists of three bedrooms, a bathroom, a kitchen, a dining room and a living area. The latter three areas are set in the centre and allow autonomy of the remaining areas, which act as satellites to round up the design, while at the same time complementing the half-open kitchen, which represents the centre and forms a sort of a square together with the water feature. 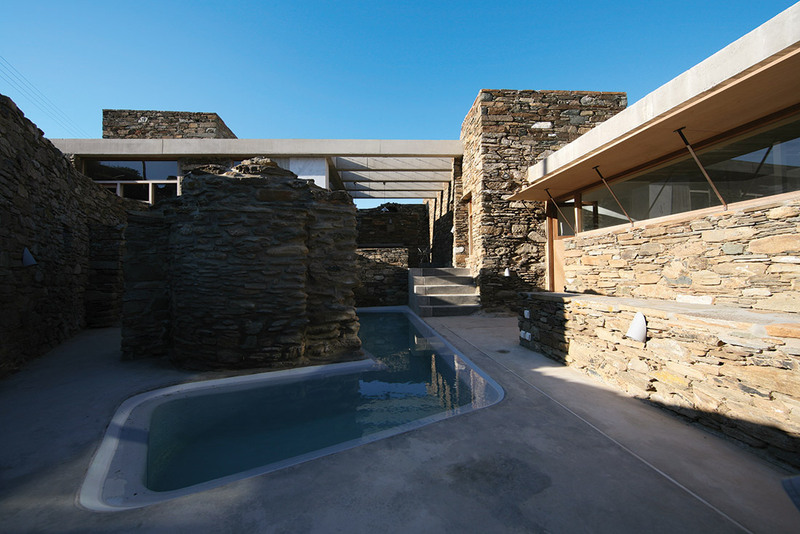 The walls are built of local stone and they support the concrete roofs. Even the interior and exterior paving continues the story with its truly authentic appearance. The interior design features wood, glass and marble. Cooling is provided through natural ventilation, as it is possible to open every space from both opposing sides. There is a special interior design element – a concrete dining table which is located in the open section of the house, under the concrete pergola. The latter narrows and forms a working counter inside the kitchen. The realm of the artificial merges with the ancient feeling of experiencing the architecture through an interaction between the world around us and or intimate perceptions. Thus, the house resides within its inhabitants, while they, in turn, reside in the house. Emmanuel Choupis graduated from the Tolbiac School in Paris in 1994. He has collaborated with Claude Parent, Jean Nouvel, Claude Vasconi and Alexandros Tombazis, and was a partner of letta – iXi architecture studio. He has been an independent architect since 1998, and he established his own agency mXarchitecture in 2004. He has carried out numerous small and large-scale projects, studies and competitions in housing, hospitality, health, offices, shops and urbanism. He has been teaching architecture at the National School of Architecture Paris Val de Seine since 1997. 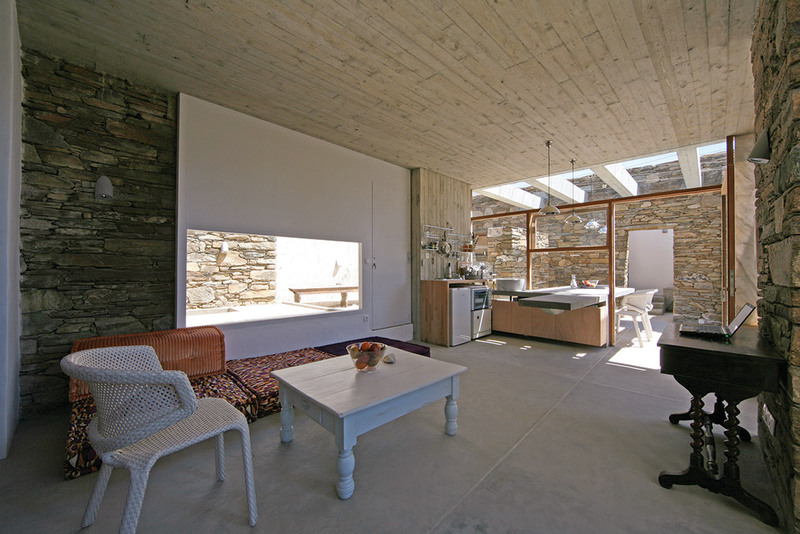 A French architectural office designing a house in Greece – how did that happen? We approached this village-house project as we would any other office project. Being Greek and being familiar with the Cycladic islands, I was determined to avoid disturbing the rural core with a staggering building, yet at the same time I wanted to bring in space, light and full adaptability – being able to spend holidays with family and friends as well as moving in permanently – at reasonable costs. The location of the house is very specific – Tinos has a rich history and distinct environment with its terraced terrain. How did this affect the project? We were actually trying to find meaningful ways to answer these questions, acknowledging most building opportunities in olden Europe take place in pre-existing tissues, which are often very sacral in their traditionality. As is often the case in such contexts, we had to deal with certain conservative regulations, but at the same time we were excited about having the chance to renovate the ruins in an empty shell of a building located in this specific area. In order to satisfy the actual and future needs we decided to use the whole area thus maximizing free space continuity, and to put together a collective space and maximum individuality within a chess-like open grid pattern. The shared inner and outer spaces became one entity. After carefully observing the island we discovered its “handmade” landscape as well as the lost or hidden traditions which contributed to a great variety of this project’s components: agglomerating dwellings around flowing water, terrace levelling to reveal slope, stone prism cells as the pigeon loft tower, raw materials association introducing marble serigraphy-sculpted facade, and using a concrete structure allowing maximum dimensions of open shelter. The aims and qualities of this project were recognised by the architectural commission of the Cyclades which, despite its design’s originality, immediately gave us their approval. They even accepted the raw concrete slab which did not match the colour of the stone, which is normally against regulations. Only local craftsmen were hired for the construction, and their excellent skills and motivation rendered possible a truly great realization of the project, including the elements they built for the first time, such as the suspended raw concrete kitchen table. We used the available local materials, reusing all the stone there. How did the local community accept the project? We are regularly informed by the villagers about the people still arriving today, admiring the house, and taking pictures of it. A group of students also asked us for some more detailed information on the project, and we found out that the house is on the list of their first-year case studies. It is worth mentioning that in recent years several remarkable housing projects have been built in Tinos. Some of them have been designed by young Greek architects who have recently decided to move, live and work in the island. Considering the rigidity of the Greek residential architecture policy throughout the history, this phenomenon differentiates Tinos and qualifies it as a pioneer of new, positive trends enabling extremely welcoming ground for the development of contemporary cultural experience.